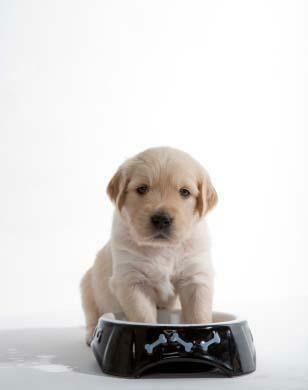 Making home cooked dog food is a healthy and economical way to feed your pet. Many dog owners have begun cooking for their animals as a way to avoid harmful additives. Other owners need to cook for their dogs because of a health-related issue. Whatever the reason, you can prepare your dog's food easily. Many people think dogs should eat only protein. This is incorrect. Dogs, like humans, require a variety of meat, starches and vegetables to meet their basic nutritional requirements. If dogs eat only protein, they will lack important vitamins, and this can lead to deficiencies and even thyroid problems. If they do not receive enough protein, they may suffer from poor immune function, muscle deterioration and blood disorders. So, a balanced diet is essential. Many vets recommend a ratio of 40 percent protein, 50 percent vegetables and 10 percent starch. Each of the food categories has a wide variety of ingredients from which to choose. The most important aspect is that the ingredients be fresh and contain no additives. It should be noted that you should never use any ingredients that are spoiled or contain mold. The rule of thumb is never feed your dog anything that would be dangerous for you to eat. Garlic is a controversial ingredient. Raw garlic is especially discouraged. However, many home dog food chefs include a clove or two of cooked garlic as an ingredient. Check with your vet regarding including garlic in your pet's food. While wolves in the wild eat raw food, it is important to cook your dog's food for safety sake. Salmonella is in chicken and other poultry. It is only eliminated by cooking the meat until it reaches between 160 and 180 degrees Fahrenheit. Follow the video tutorial or step-by-step instructions below for a simple but healthy dog food recipe, or check out other options such natural dog food, kibble, or meatloaf. Remember the dog food ratio of 40 percent protein, 50 percent vegetables and 10 percent starch when deciding on the actual ingredients. Fill a large Dutch oven with water, and heat it to a slow boil. Wash and chop potatoes. Include the skins. Add to the boiling water, and cook for ten minutes. Add ground turkey, beef or boneless chicken to the pot. Add fresh or frozen vegetables. Use a variety, such as carrots, peas and spinach. Remove the pot from the heat, and allow it to cool. Spoon the food into freezer containers and freeze for future use. Dogs don't need the seasoning that humans do. Don't add salt, pepper or any other seasoning. Fresh vegetables are usually cheaper than canned or frozen, and they have more vitamins if they are picked at peak ripeness (from your garden or a farm stand). If you must use canned vegetables, check for the lowest salt content. Make the food in large enough batches that you only have to prepare the food once a week at most. Be mindful if using human leftovers. Do they have butter, seasonings or other ingredients that are not good for your dog? If so, don't use them. Always check with your vet when changing your dog's diet. Ask your vet if your dog should have any nutritional supplements. While some people feed their dogs only home-cooked food, it doesn't have to be an all-or-none proposition. Unless your dog has to eat homemade food for a specific health reason, you can feed your pet a mixture of store-bought food and food that you prepare in your kitchen. Even if you don't cook for your dog full-time, you can still cook on occasion to provide a healthy alternative to his regular diet.